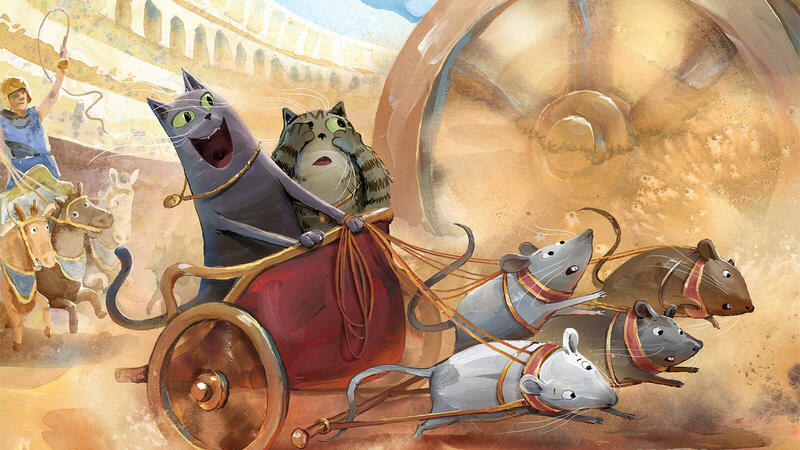 A detail of Cleo and Cornelius racing chariots at the Circus Maximus in the children’s book, Cleo and Cornelius: A Tale of Two Cities and Two Kitties. 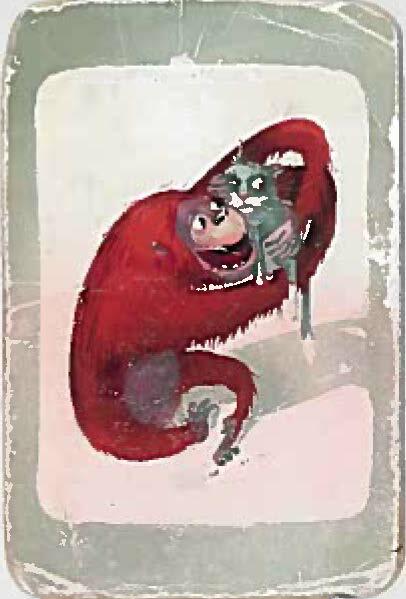 I was first introduced to the work of children’s book illustrator Michelle Thies through a 2 x 3 inch image of a gorilla hugging a kitten. It was the summer of 2013 and I was attending my first Society of Children’s Book Writers and Illustrators Conference in Los Angeles. As I entered the California Ballroom of the Hyatt Regency Century Plaza filled with anticipation, inspiration, and at least two cups of coffee, I spotted a table with illustrators’ business cards. The gorilla and a kitten on Michelle’s card instantly caught my eye. I loved not only her whimsical sensibility and artistic skill, but also her ability to convey distinct personalities in one dynamic moment. Michelle’s card has been in my wallet ever since. Needless to say, I wished to work with her one day. Illustrator Michelle Thies’s business card, which the author has carried in her wallet since 2013. Fast forward to late 2016 when I was invited to work on a children’s book associated with the exhibition Beyond the Nile: Egypt and the Classical World (March 27–September 9, 2018 at the Getty Center). The exhibition highlighted the cross-cultural artistic interplay between Egypt, Greece, and Rome from the Bronze Age to the Roman Empire, and the book—Cleo and Cornelius: A Tale of Two Cities and Two Kitties—was to be a loose retelling of the fable “The Town Mouse and the Country Mouse,” but with cat cousins living in ancient Egypt who stow away on a ship for adventures in ancient Rome. 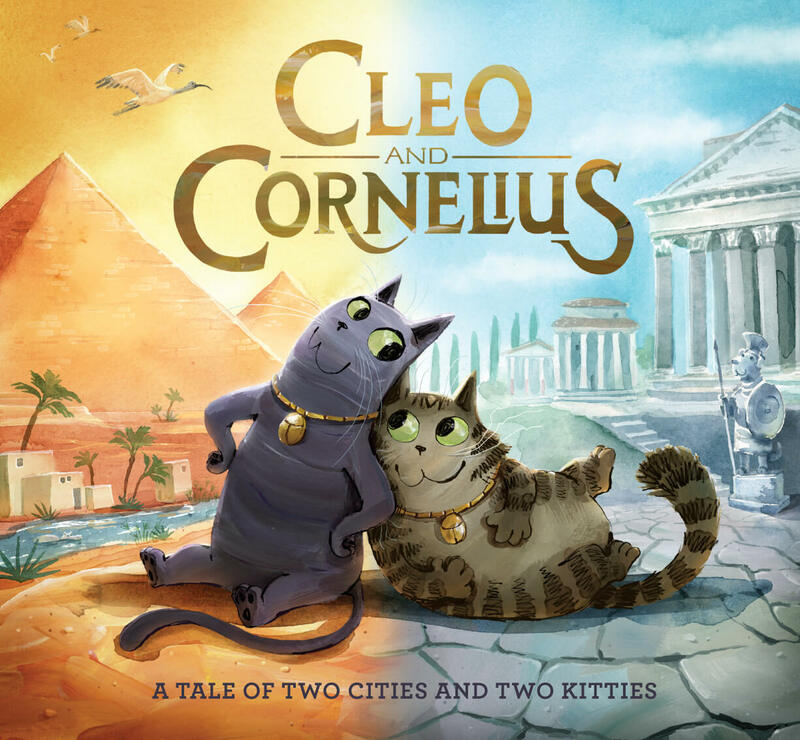 Cleo and Cornelius: A Tale of Two Cities and Two Kitties, written by Elizabeth Nicholson, Janine Pibal, and Nick Geller, with illustrations by Michelle Thies. Published by Getty Publications, 2018. 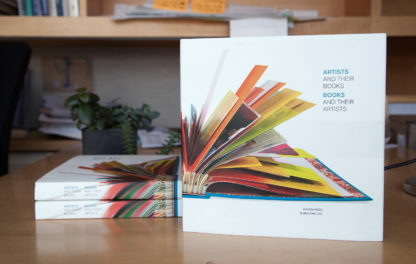 Once the project was approved, my co-authors—Elizabeth Nicholson and Nick Geller, Getty Publications senior editor and graduate intern, respectively—and I needed an artist who would illustrate the book brilliantly and quickly. We wanted someone “contemporary and fun, with a distinct graphic style.” I compiled a list of suggestions and, of course, Michelle was at the top of that list. As fate would have it, Michelle had published a graphic novel titled Farm Cat! Pharm Cat! 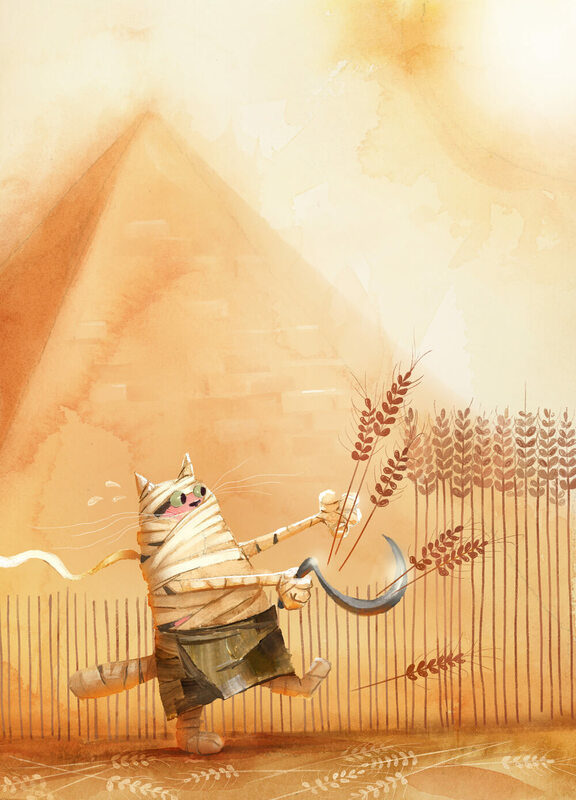 (A History) with many “contemporary and fun” images of cat characters, including an illustration of a cat mummy! We met with Michelle, loved her sample illustrations, and offered her the job. I guess some wishes do come true. Whether Michelle is working as a visual development artist and background painter in animation, or designing and illustrating characters for a book, “the goal of the work is the same: to communicate an idea in the clearest way possible, with visual appeal.” With Cleo and Cornelius, one of Michelle’s objectives was to bring the cat cousins to life amid two ancient landscapes just before the Romans conquered Egypt in 31 B.C., when cats were beloved and considered sacred by Egyptians. Once she was on board, we sent her visual references to assist in her process. 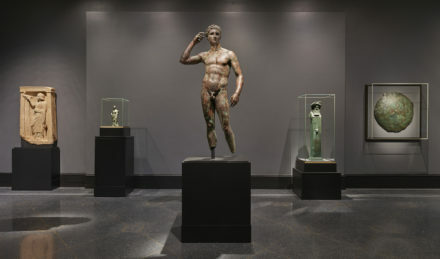 She aimed “not to include every little detail, but to try and find the atmosphere and feeling that those images and facts added up to.” But she clarifies that certain aspects of her illustrations were not historically accurate: of course, an ancient Roman statue of a soldier would have been sculpted as a human rather than a dog! 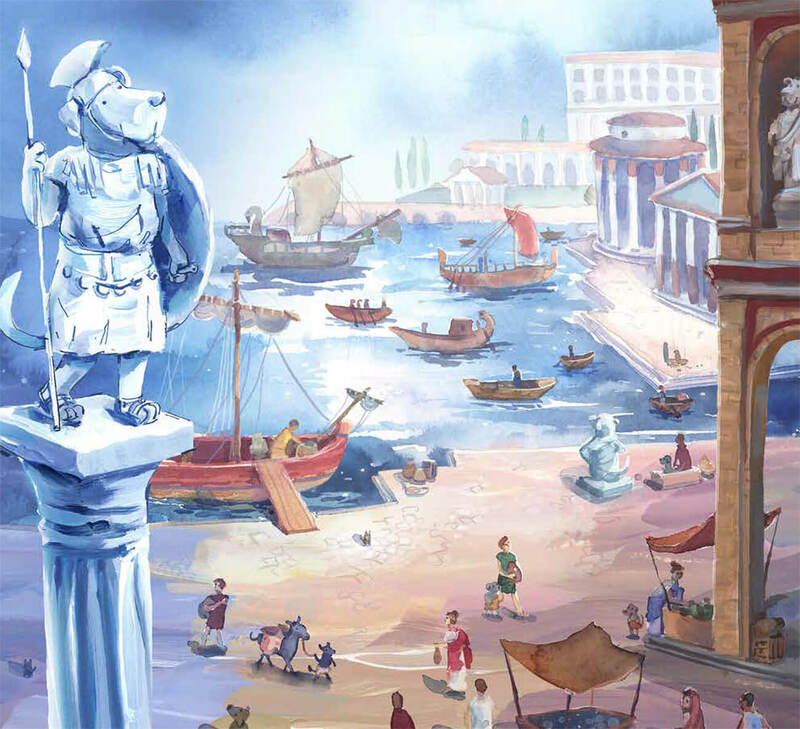 A page from Cleo and Cornelius shows how Michelle incorporated historic and imagined details of ancient Rome. Michelle wanted to represent Cleo and Cornelius as cats who would have been familiar to ancient Egyptians. One source for this information were representations of the ancient Egyptian cat goddess, Bastet. Seen as a protective mother goddess of fertility, Bastet was often depicted in ancient Egyptian art as solid black or dark colored. Yet many wall reliefs and paintings in ancient Egyptian tombs also portray cats with stripes or markings. This coloring was typical of the local ancient cat, which resembles the modern-day tabby cat. 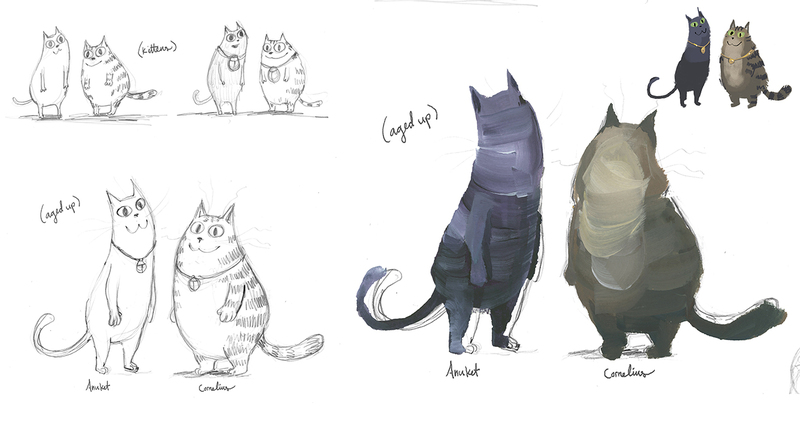 Michelle’s concept sketches of Cleo and Cornelius. Beyond the Nile featured dozens of artifacts from ancient Mediterranean cultures, some of which were included in Cleo and Cornelius for readers to seek and find. These “added a lot of depth and historical context to the illustrations,” notes Michelle. 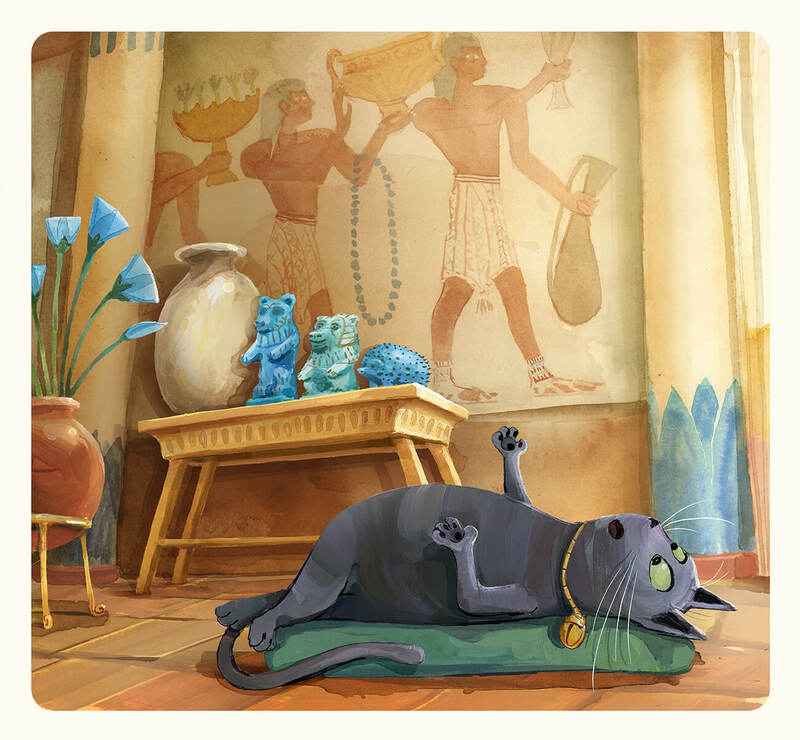 The objects in the background of this page are based on artifacts that appeared in the Getty Center exhibition, Beyond the Nile. 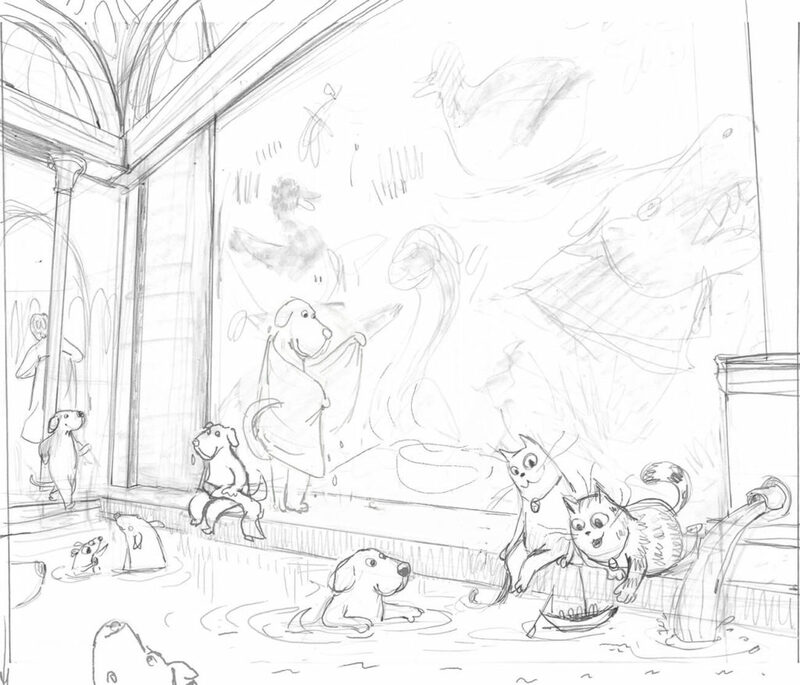 The scene in the Roman baths, from early sketches through finished product. 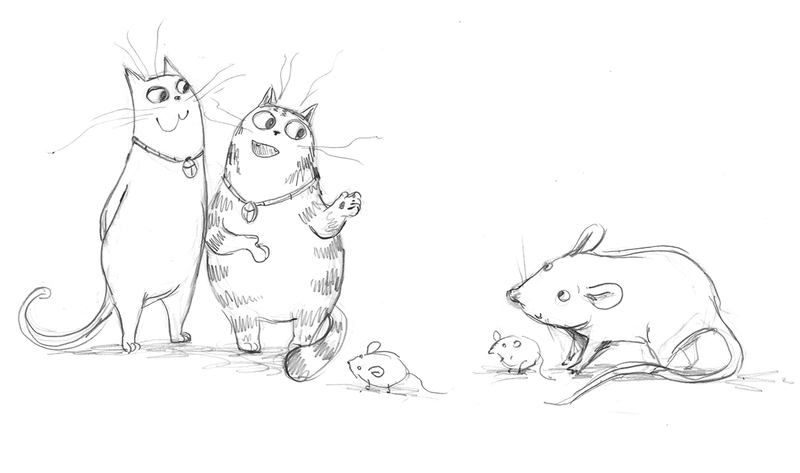 Another of Michelle’s sketches for Cleo and Cornelius. Michelle’s skill in conveying a compelling and creative story is clearly evident even in the 2 x 3 inch space of a business card. In a delightful reversal of norms, the kitten is the cautious, watchful adult, while the gorilla is the unpredictable, playful child in this miniature scene. As she displayed in imaginatively illuminating our tale of two cities and two kitties, Michelle is not disconcerted by so-called limitations of space or (ancient) time. With her artistic talent in visually enlivening characters, moments, and timeless adventures, I believe her work is right at home within the Getty’s walls. 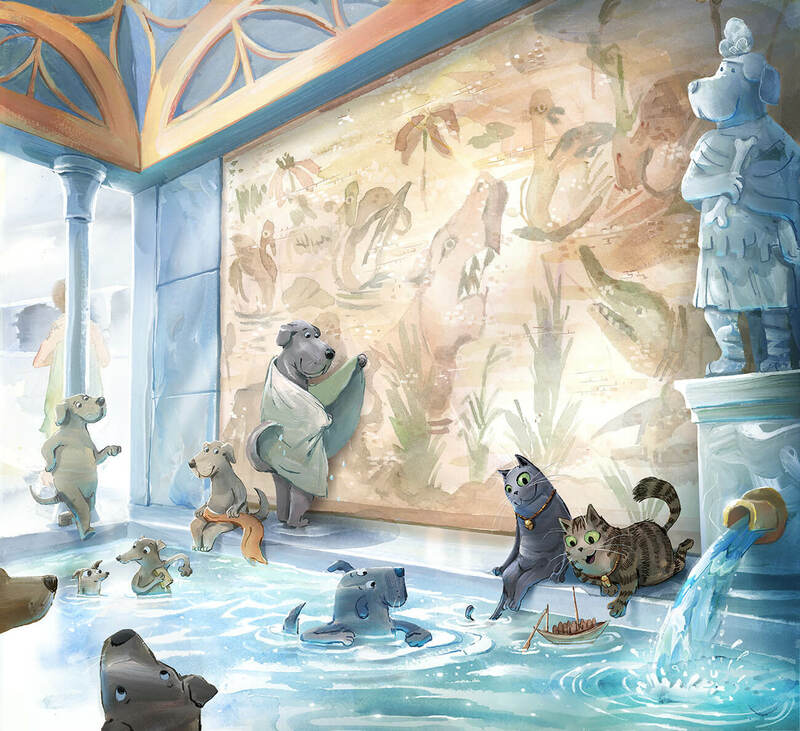 An illustration for a two-page spread in the book shows Michelle’s skill in creating dynamic characters and worlds through illustration. Wonderful blog post! 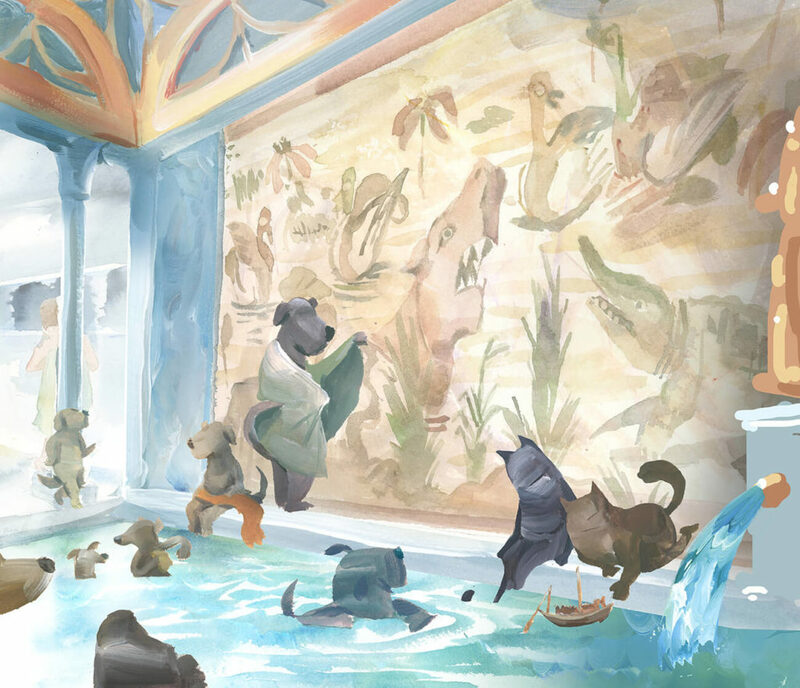 It gives a fascinating look at the illustration process for this charming and fabulous book! Michele Thies is my niece. She is so talented artistically, so true to life and has grown into outstanding young lady. I am so proud that she was given this opportunity to show her talent in such a worthy endeavor. I love talking with her and hearing about what she is working on now. Outstanding artwork and storytelling. I just wonder if the artist painted in watercolor or digital? I love the technique & style. 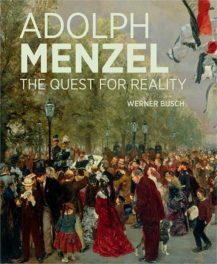 Lovely and insightful blog, and I look forward to getting the book. As a note on the business card though, that does not show a gorilla — it looks a lot more like an orangutan, an animal from Asia, not Africa. It may seem a small difference but it would be like confusing the Phoenicians with the Greeks. History (and art) turns on small distinctions. I love Cleo and Cornelius! So cute and educational at the same time. Great blog.